I just saw The Greatest Showman, and fellow geeks, I have a new mission in life: to make sure every one of you who needs an uplifting, inspiring kick-in-the-pants goes to see it immediately. There's really nothing I can write here that would be a spoiler, because what you see in the trailer is what you get: a rousing musical about outsiders banding together to find love, family, and most importantly, pride in their differences. 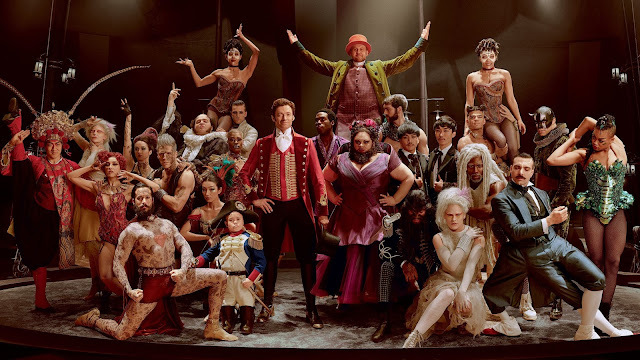 The Greatest Showman has no surprise twists or mysteries or "Gotcha" moments; the only really shocking thing is how they managed to make every single song so darn catchy. It also has the distinction of being the first movie to have me in tears within the first 15 seconds. (Yes, SECONDS.) Not sad tears, mind you; just awe-struck, fist-pumping, grabbed-by-the-gut because oh-my-gosh-this-is-so-beautiful and I-was-not-expecting-this tears. Greatest Showman starts with a literal foot-stomping bang - you can see snatches of it in that trailer - and I want to see just those first few minutes at least 50 more times. There are so many great anthems in this movie it's hard to pick a favorite, and many/most have this fantastic driving beat; the kind of fight-song staccato that rumbles through your chest and makes you want to get up and shout. Add to that the gorgeous lyrics about being warriors, being proud, re-writing your own destiny, etc., and, well. WELL. And here's another video from the same session of another absolutely incredible song, "This Is Me." Both of those numbers look and sound so much better in the film, but my gosh, do you see all that emotion? I mean, when she grabs Hugh's hand, and they're both crying? I'm talking BUCKETS over here, gang. I'll add a quick caveat to say that of course this is a completely fictionalized and sanitized re-telling of P.T. Barnum's story, and of course there are things from the real history that have and should be criticized - but again, this is pure fantasy. If you're already planning to tell me why the circus and Barnum were bad and why romanticizing them is bad, then obviously this isn't the movie for you. That'd be a shame, though, because Greatest Showman really does have a beautiful, hopeful message about humanity. Not to mention some ROCKING costumes, gorgeous sets, and dance numbers to take your breath away. I really want a Ringmaster's jacket now. You know, more than usual. That kind of energy is infused through the whole movie, and you can't help but come away grinning and tapping your toes. If you've been lagging a little like I have since New Year's, then this is just what the doctor ordered. Alexander and I loved it too. It's everything you ever want. It’s everything you ever need. And it’s right here in front of you. It's everything you ever need. And it's here right in front of you. I've been listening to the songs on youtube for the past month, and I saw it the other day and alreayd have another trip lined up. It's so good! I have been dying to see this ever since I first saw the trailer, but leaving the house for a movie is a big commit for me due to mental health issues, so I haven't gotten there yet. But hearing this review gave me even more encouragement to keep building up the reserves so I can get there. SO GOOD!! I want to go back and see it again. I've been listening to the soundtrack over and over. The choreography was so so goood!!! I went with my daughter and a couple of friends last night. It was AMAZING. I got the same happy, blown away tears at the opening as well. I was just entranced all night. I've been listening to the soundtrack as well and it's so so so good. I'm not someone who goes around listening to music all the time (I'm a podcast girl) but this soundtrack is so good I can't help myself. Wow. The only commercials I'd seen for this so far just had two guys saying, 'Hey, we should put on a big show! ', and then a trapeze girl catches one of their eyes. That is pretty much it. Who is in charge of these commercials?? Hubby and I saw this New Year's weekend. About a third of the way through we had already agreed that we need to own both the movie and the soundtrack. It's FANTASTIC! This movie is AMAZING. The costumes, the dances, the sets, the actors, the SONGS. Everything is theatrics in the best way. Highly recommend. As for the whitewashing- the way I see it? It's less history as it was, as much as history as it SHOULD have been. It's redeeming the idea of the freak show, elevating it from the mockingness into something beautiful. And inaccurate, the very idea of it, the fact that they CHOSE to do that, speaks to the very heart of the movie. To not hide who you are for fear of failure or the jeers of the crowd, but to be proud of who you are. LOVE THIS MOVIE SO MUCH. and the passion behind it (from Hugh, and Keala, and Zendaya) is so inspiring. I'm not a fan of the "real" Barnum but I loved this movie anyway. Circus (trapeze) saved my life and I'm glad the spirit of circus is reaching more audiences through this movie!! I kept trying to figure out why you were sharing the Greatest SNOWman with us & what a lady with pink hair had to do with snowmen. I actually had to start the trailer to finally realize it was "show" not "snow"
Walked into the theater without knowing it was a musical, and was blown away! Yes, SEE THIS MOVIE! Going to see it for a 4th time this week!! i just love this movie, the music, and everything about it. My daughters loved it after seeing it with friends and dragged the rest of the family to see it again. Everyone loved it, including my reluctant husband and 12-year-old son. Glad they are making more musicals in general too. Saw this with my mom on Christmas Eve and we were both blown away. The music, the actors, the choreography, it's all amazing. I had only been home about an hour before purchasing the soundtrack and have listened to it multiple times since. There isn't one song that I don't love. As for the people who've been critical that it's sanitized and not accurate about PT Barnum, WHO FREAKIN' CARES? I didn't go into it thinking it was a serious biopic, I went into it to be entertained. And I WAS. I'm happy to see you've already seen all the YouTube vids I would have linked you to. Keala getting so emotionally into This Is Me gives me CHILLS. I sort of dragged my son to see this movie today, hoping for him to hear the line from the trailer where Jackman says, "No one ever made a difference by being like everyone else." I've been saying variations of that to him for all of his 18 years. Wanted him to hear it from someone else and have it really resonate with him. I didn't hear the line in the actual movie though. Did I miss it somehow? Does anyone else know for sure whether that line is actually in the movie and where? I mean, I think my son got the general message of "Be yourself and never give up." But, I wanted to him to hear the actual line word-for-word: "No one ever made a difference by being like everyone else." It's probably in there, but I swear I didn't hear it. If someone is going to see the movie again or for the first time soon, please listen for me and report back. I'm sorry to be the rain in this parade and I'm sure the is great and fun, but the real person who "inspired" this movie was one of the worst kinds of human beings. He exploited all that was under his care, and then went to politics, to feel more at home wiht his evil peers. Ah, I see you didn't actually read my review. Ok. Um... thanks? OMG, run, don't walk. I'm really not a crier, but "This Is Me" brought me to tears in the theater. Ever felt like an outsider? Ever constructed a found family (which may or may not include some of your blood family) that made you feel accepted and loved and empowered? Ever not had that happen and need to feel like you still might find that? GO. SEE. THIS. MOVIE. I'm so glad you posted this! We've seen "The Greatest Showman" three times and will probably be joining Anonymous for a fourth visit before it leaves the theaters. For anyone waiting until it comes out on DVD/streaming services, do yourself a favor and don't wait. It's the kind of spectacle that needs to be seen on a large screen and it's one of those films where the audience's enjoyment contributes to your own. I'm so thankful movies like this are still made. It's rare to find a movie that's inspirational and aspirational these days -- so refreshing to see art that celebrates instead of wallows. Thanks for posting and getting the word out! Saw it last night and WOW. Yes, I know it's glossy and happy when the reality wasn't. It's FICTION. It's also my 10 year old's new favorite movie. Amazing songs, amazing story, amazing dancing, amazing costumes, visually stunning, and just a heart-warming message. This Is Me is definitely the song of songs. LOVE!!!! I felt the same way! It just made me happy and I didn't realize it was a musical when I went. I can't wait to see it again and buy it when it becomes available. I agree this was amazing on the big screen and if you can see it that way, you should. Thanks for your review. Well, I've been wanting to see it...so after reading this and watching the videos, I went and did something I almost never do - went to the movie by myself. And now I want to see it again. Sure, it's purely a fantasy, inspired by the idea of Barnum - not the reality - but I like to think of it as a vision of how we'd like it to have been. Chang & Eng doing flips = awesome, even if it's not even remotely close to the truth! Also, I was running late and missed the very beginning (came in during that first number) but I understand about the effect it had on you. I had a similar reaction to the opening number of the Lion King musical when the traveling company came here - it blew me away. Regarding the negative press around this musical because of the real life of PT Barnum...don't MOST musicals gloss over the grim reality of their subject matter and portray happy, snappy, uplifting songs etc (after going through some hardship and learning valuable lessons, usually)? And let's not even go near the factual errors, like in The Lion King (which I, and many others, love despite them)! Why should Greatest Showman be judged differently? I felt the same way leaving the theater! Called several friends on the way home and said, "You need to see this!" And made plans see it again this Saturday night! Jen - We saw it Friday and wholeheartedly agree with you on every point you made! I had chills and was in tears in the first minute. LOL and so was my husband! We were sad neither kid wanted to come with us, but this one is definitely on the list for ownership. I can't wait to see it again. It truly is fabulous on the big screen! I saw this yesterday and was ABSOLUTELY blown away. I had no idea -- didn't know anything about it and now I cannot WAIT to see it again!!!! Thanks for your disclaimer, Jen. I wish I could enjoy the movie as the fantasy it clearly is. If they had taken a couple more steps to remove it from the source material I could have. To those asking what's the harm and who really cares? There danger in presenting this fantasy is folks assuming it's reality. It strikes a bit too close to home for some of us and rewrites history in a way I'm not particularly comfortable with. However, if you enjoy the movie and realize it's not reality, go enjoy the movie. It's a spectacle of the highest order and knows exactly what it is. We loved the movie. My 11yo son is super super SUPER into the soundtrack - we bought it as soon as we got home! My husband couldn't quite get over the fictionalized/sanitized Barnum stuff. I just took it as *entirely* fictional and went with it. Every Christmas Eve in Victoria (Australia), there's the Carols by Candlelight, a big, televised show to raise money for the blind. This has been going on for decades, and having it on TV, if only in the background, is What You Do on Christmas Eve where I live. Keala Seattle sang 'This is Me' this year. It's on youtube, and I recommend watching it partly because, backed by an amazing gospel choir and a full orchestra, she brings all that emotion again. But mostly, watch for that second of awed silence at the end of the song, before the whole crowd of candle-waving brand new fans EXPLODE. Did people not see Moulin Rouge because it glamorized prostitution & alcoholism? I saw The Greatest Showman knowing full well that Barnum was not a pleasant human being & the B&B Circus finally closed permanently at the end of the year (yay!). Did that stop me from enjoying The Greatest Showman? Not. At. All. I think I'm the last person to know about it- it got on my radar from the Golden Globes win for "This Is Me," then read this review. Found out friends saw it & loved it & my husband & I finally saw it. :) He also said, "That was like Moulin Rouge." (& he liked both movies, too). Count me as another one that has the soundtrack on repeat & I'm going to try to see it again before my winter vacation is over. It is truly a stunning testament to the power of P.T. Barnum's hustle that modern people are somehow being suckered into finding his freak show inspiring. I'm going to see this with my mom tomorrow. I wasn't really planning on seeing it in the theater, but she saw it recently, absolutely loved it, and insisted on taking my niece and I. With this review to go with her excitement, I'm really looking forward to it!